I have been extremely productive at work recently, as you can see under the cut. That said, I really enjoy my job - I work with nice people and I feel like I'm pretty good at it. Plus you can never underestimate the calming influence of having a regular routine. Yesterday I went to a Young Singers' Day with my good friend Astride and did a bit of alto-ing for the first time in ages. I think I'm a tad rusty on the whole singing-in-harmony thing (sopranos really do have it easy), but it was great fun and just the right amount of challenging. We were conducted by Leslie Olive, who really knew how to bring out the best of a slightly shy group. The repertoire was a good mix, and included the Hallelujah Chorus (just for fun), Rutter's version of All Things Bright and Beautiful and Lauridsen's OÂ Magnum Mysterium. 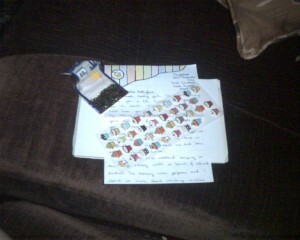 I've been in a bit of a letter-writing mood recently, and have been doing so with the aid of my lovely cupcake stickers, number confetti and good old colouring pencils. So a couple of gorgeous young women of my aquaintance will be getting some love in the post soon. And by "love", I mean odd rambling stream-of-consciousness meanderings with occasional illustrations and in one case, some post-it notes. Do you want a letter? Comment and I'll send you one. All of March with all my news. 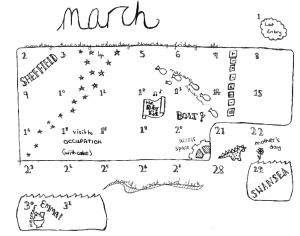 So I haven't updated in a while... to make up for this I've made a little calendar page of what I did for all of March - it's extremely cute, I promise. Here it is - hover over it with your mouse for my comments and some fun links. Since then I've started working in yet another department in the hospital, I've made a couple of websites and persuadedÂ my scanner to work with Linux, so I'm pretty happy all in all - although that could be because I switched antidepressants a week or so ago. Or it could be the falafel I had for dinner. I think I'm pretty easily pleased. My plans for the immediate future largely include baking cookies and drawing zeppelins. Sounds good, no? Pinboards, teacosies and anatomically-correct romace. Most of what I've been doing recently has been web design, something which I really enjoy since it bridges the geeky/creative divide so nicely. My webcomic, Teacosies With Irony has been rather neglected in recent years, and will continue to be so for a bit, while I concentrate on other projects, but I've been meaning to make a nice, simple archive website to showcase it (because oh, I am proud). And this was REALLY fun from the geeky perspective because look what happens when you press the arrow keys on your keyboard!! I am so impressed by that, I may melt. Also it took me AGES. The other thing was a website for my best mate's dad, for his company Meridian Training Solutions. It's not quite finished as I write this, but I really like what I've done with it. I think it'll look very good on my portfolio if I ever get around to making a portfolio. Oh, and if you need a financial services trainer, well, you know where to go. Speaking of geeky, just look what I have done to my poor unfortunate laptop. Let me explain, the keyboard, battery and hinge have been broken on this machine for some time, but I've just been using it for music and video, no problems there. Then the backlight on the screen broke. Ah. Well, I could have bought a new backlight and fixed the problem, or something sensible like that, but instead I thought it would be more fun (and it WAS), to disassemble the poor thing. 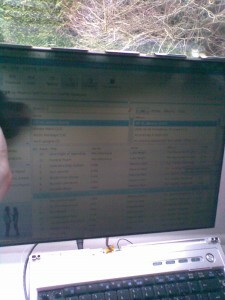 Turns out LCD screens are really cool - look how pretty it is when I hold it up to the window! So I have plans, involving building a new case for the machine that I can leave on my windowsill during the day so the screen is lit with sunlight, then sit in front of a lamp at night time. Practical? No. Awesome? I think you know the answer. For Valentine's day this year I decided to take what I consider to be an admirably anatomically-correct attitude towards romance*. You may notice the background of this card is a William Morris print - I found a bunch ofÂ patterned notecards in a charity shop a while ago, isn't it pretty? This particular one is called "Strawberry Thief". I think the additional artwork uses Tippex rather pleasantly. 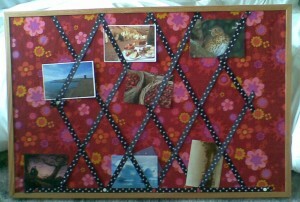 One last example, from the surprisingly fun craft of Stapling Fabric To Things is my new pinboard. I needed some way of displaying postcards from friends, nice photos and other pretty things that wouldn't have me scraping blue-tack off the walls in the distant future. Pretty, no? More from me soon, keep your eyes peeled. 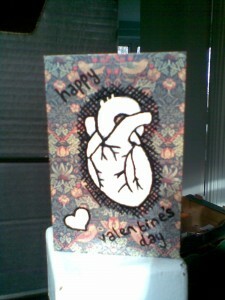 *Uh, although of course in reality the circulatory system has little to do with human affection, as far as I'm aware.